Marc Marquez, Valentino Rossi and Jorge Lorenzo will line-up on the front row of Sunday’s MotoGP grid after a dramatic day in Argentina. As speculation swirled that riders will be forced to race with the hard rear tyre compound following a scary incident for Scott Redding in final practice, the delayed qualifying sessions saw a spate of front end accidents at turn 1. Last to fall through the long left-hander was Marquez, the Repsol Honda star taking a few seconds to stand up after a heavy impact. The Spaniard was guided straight to parc ferme on his return to the pits, having kept pole despite the spill. It was his second fall of the day, both at Turn 1. 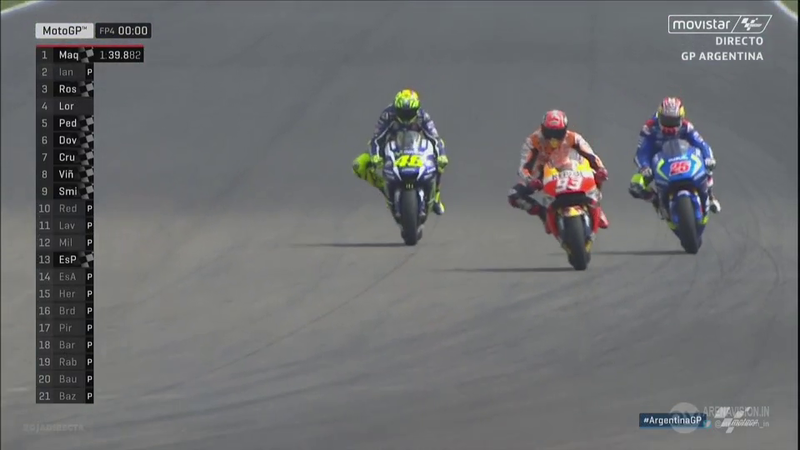 Movistar Yamaha team-mates Rossi and Lorenzo (big Turn 1 accident in final practice) saved their best laps for last to complete the front row, 0.375s and 0.533s behind Marquez, whose team-mate Dani Pedrosa heads row two. Andrea Dovizioso got the better of Ducati team-mate Andrea Iannone for fifth position, with Maverick Vinales the top Suzuki in seventh. A sick Hector Barbera claimed top satellite honours for Avintia Ducati in eighth, followed by Cal Crutchlow (LCR Honda), Pol Espargaro (Tech 3 Yamaha), Aleix Espargaro (Suzuki) and Bradley Smith (Tech 3 Yamaha). 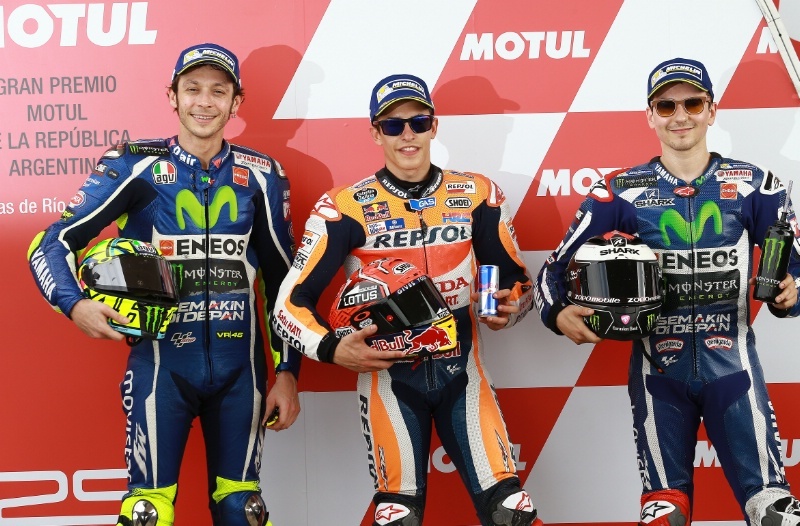 Smith and team-mate Espargaro progressed to Qualifying 2 by leading the Qualifying 1 session, but the Englishman would later become another Turn 1 victim – thus joining the likes of Marquez, Lorenzo, Crutchlow, Jack Miller, Vinales, Aleix Espargaro and Pol Espargaro. Rossi won last year’s Termas de Rio Hondo race after using the hard rear tyre to hunt down Marquez. The Honda rider was then dramatically flung down the road when the pair tangled moments after Rossi snatched the lead on the penultimate lap. Monster Yamaha Tech 3 duo Pol Espargaro and Bradley Smith joined the top ten MotoGP™ World Championship riders for Q2. The track temperature was just above 40°C, slightly warmer than in FP3. All riders headed out with the hard front tyre and the medium option Michelin tyres for the start of the 15-minute session. It didn’t take long for the fast times to come, Marc Marquez (Repsol Honda Team) ‘easing’ into the session with a 1’39.411, the fastest lap of the weekend. 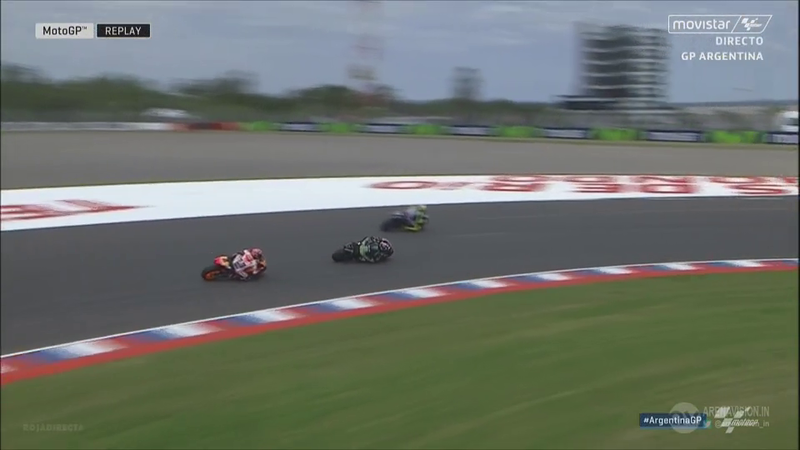 This time immediately put him a second clear of the rest of the field and saw the other riders playing catch up. Unlike in Qatar, Jorge Lorenzo (Movistar Yamaha MotoGP) returned to the pits after just a single flying lap, opting for a slightly different strategy to the rest of the field. His teammate, Valentino Rossi, chose to stay out for several laps and was the second rider to drop into the 1’39s by the half way mark of the session. Two or three stop strategies didn’t matter as the session came to a close, Marquez untouchable in the session. A crash at Turn 1 with three minutes remaining saw the Spaniard unable to improve his time, but no rider was able to get with 0.3s of his 1’39.411. This is Marquez’s first pole position since Phillip Island in 2015 and his 13th consecutive front row start in the premier class. 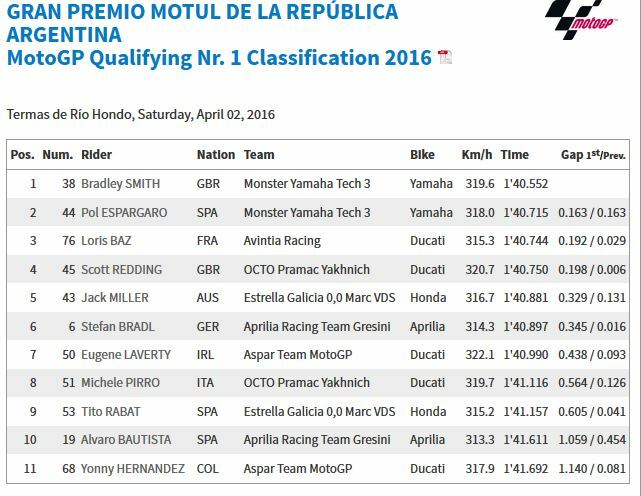 On each of his visits to the Termas de Rio Hondo, Marquez has started on pole. 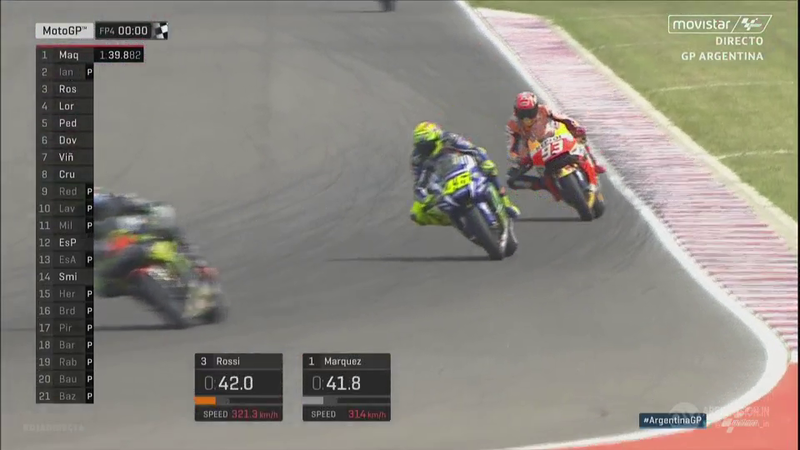 A 1’39.786 saw ‘The Doctor’ as the only rider able to get within half a second of Marquez’s time. This is just Rossi’s 13th front row start since returning to Yamaha in 2013. Rossi’s last front row start came at the Malaysian GP in 2015, where he went on to finish third. The Italian proved in Qatar that if he can stay with the front riders he can battle for the podium, second on the grid gives him a perfect perch to launch from and stop Lorenzo and Marquez escaping. Completing the front row is defending MotoGP™ World Champion Jorge Lorenzo, third his worst grid position since he was fourth at the Malaysia GP in 2015. His 1’39.786 was 0.533s back on Marquez’s time, both riders having fallen at Turn 1 over the course of the Gran Premio Motul de la República Argentina weekend. Due to his crash in FP4 the Majorcan had only one bike for the session, a second fall would have been devastating. The top three were the only riders able to drop into the 1’39s. Dani Pedrosa (Repsol Honda Team) will lead the charge from the second row, 0.6s behind his teammate. Fourth is a dramatic improvement over his seventh place start in Qatar. Pedrosa will be aiming to return to the podium after missing out in Qatar, the leading riders able to break away without him. Andrea Dovizioso (Ducati Team) starts as the leading Ducati in fifth; his early pace not lasting until Qualifying as both the factory Ducati riders struggled slightly. His teammate, Andrea Iannone, will start just behind him in sixth, 0.074s dividing the two riders. Both have had historically strong races in Argentina and Iannone needs to finish in the points after crashing out of the Qatar GP. After a promising start to the weekend, Maverick Viñales (Team Suzuki Ecstar) was only able to manage seventh on the grid. 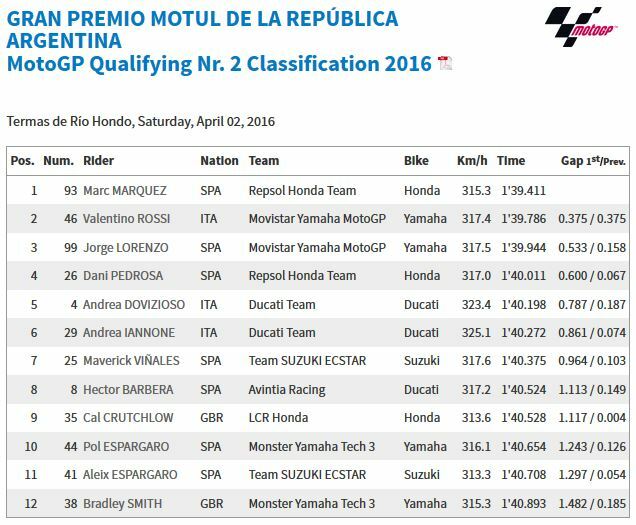 This may appear as a modest result, but is a three-place improvement over his 2015 Argentina GP start. Hector Barbera (Avintia Racing) secured the honours of top Independent Team rider once again as he grabbed eighth on the grid. Cal Crutchlow (LCR Honda) fell at Turn 1 as he began his second flying lap, the Brit on his feet and running back to the pits for his second machine immediately. He will begin the race in ninth. Pol Espargaro (Monster Yamaha Tech 3) will launch from 10th and starts ahead of brother Aleix Espargaro (Team Suzuki Ecstar). Brit Bradley Smith’s (Monster Yamaha Tech 3) Q2 session came to a premature end as he fell at Turn 1, starting 12th as a result. All of the top 12 were within a second and a half of each other. Colombian rider Yonny Hernandez (Aspar Team MotoGP) will start from 21st on the grid for his home round.